Resistant band exercises, also referred to as resistance band exercises, will help you strengthen different muscles in your body. In addition, resistance band exercises can also improve your range of motion and flexibility, decreasing your risk of injury during an athletic sport or physical activity. Resistance band exercises range from leg extensions to bicep curls and you perform many sitting down. Seated bicep exercises with a resistance band will help you increase muscle mass in your bicep as well as improve the range of motion in your arms. Sit down in a chair with your knees bent and feet flat on the floor. Place the middle of the resistance band under your feet, grabbing the ends of the resistance band with each hand. While keeping your back straight, curl your arms up by bending at the elbows until your forearms are perpendicular to the ground. Slowly return to your original position, repeating 10 times or until fatigued. Seated leg exercises will help you strengthen your quadriceps, hamstrings and glutes as well as muscles in your lower legs such as your calves. To strengthen your hamstrings and quads, sit down in a chair, placing the middle of a resistance band under your foot. While holding the ends of the resistance band with each hand, extend your leg out and away from your body, fighting against the resistance of the band. Continue to extend until your leg is parallel to the ground. Slowly bend your leg back to its original position. Repeat until fatigued. Seated chest exercises will help you strengthen your core muscles as well as your pectoral muscles and arms. While seated, wrap a resistance band around the small of your back or the back of your chair, holding onto the ends of the band with each hand. From here, pull your belly button in toward the back of your seat while simultaneously extending your arms out. Hold this position for 10 seconds before relaxing. Repeat until fatigued. Seated shoulder exercises will help increase your range of motion with respect to your arms as well as strengthen your shoulders. 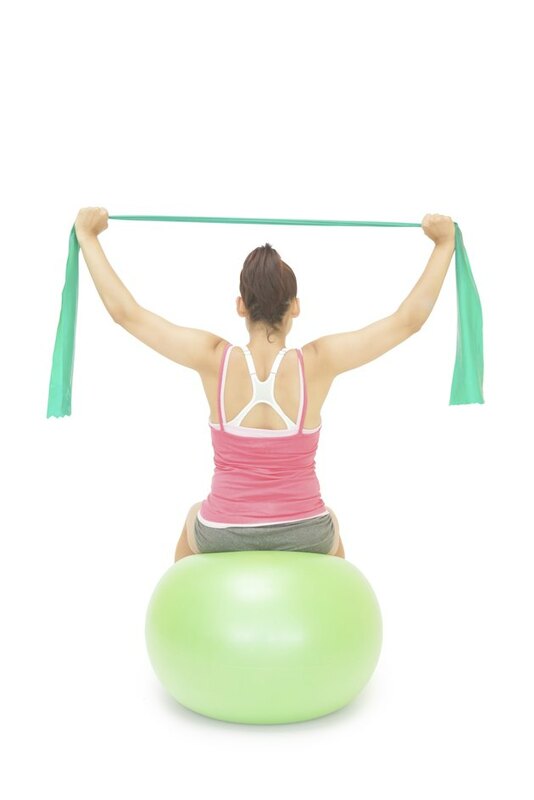 While seated in a chair, stand on the middle of a resistance band. With the ends of the resistance band in each hand and your back straight, extend your arms out to your sides until they are parallel with your shoulders. Slowly lower them back down, repeating this motion 10 times or until fatigued. Why Stand When You Can Do These 8 Moves Sitting Down? If Your Shoulder Hurts, Can You Still Work Out?